A shoreline lapped by the Mediterranean, the urban sophistication of Tel Aviv - the Dan Tel Aviv is in the middle of everything, yet away from it all. 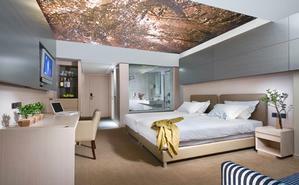 Perfect for both leisure and business guests. Luxurious accommodations, banqueting halls and fine dining. Special lounges and services cater to the special needs of the traveling executive. *please book family plan as follows: FOR 2 ADULTS + UP TO 4 CHILDREN IN 2 ROOMS PLEASE BOOK: 2 ROOMS FOR 1 ADULT + MAXIMUM 2 CHILDREN EACH. (EXAMPLE - FOR 2 ADULTS + 3 CHILDREN: ONE ROOM FOR 1 ADULT + 1 CHILD & ONE ROOM FOR 1 ADULT + 2 CHILDREN) * Guests with a foreign nationality with a B2 or B3 visitors permit stamped in their foreign passport,are exempt from V.A.T. All other guests - Israelis - are charged 17% V.A.T according to prevailing Israeli law (excluding Eilat). Israeli citizens are aware of this law. Luxuriously fitted guest rooms and suites offer splendid sea and city views. Free wireless internet access - high speed (WIFI) in rooms and public areas. Dial up via an extra telephone line. Non-Smoking Rooms. 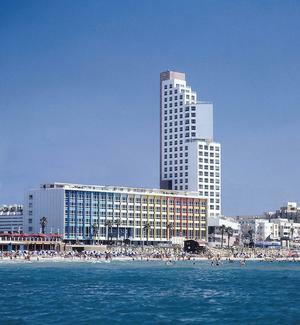 Dan Hotel is Located in the city center of Tel Aviv close to beaches and prime shopping centers and a stroll away from nightlife and business districts.